I was bored and got a few pictures of some of my more unique critters. Might add to this later when I get some better pictures of other stuff i have. Thank you @nick barta at fullthrottlefeeders for the stickbugs and giant cave roach(among many others). These guys have been really cool and are doing great. 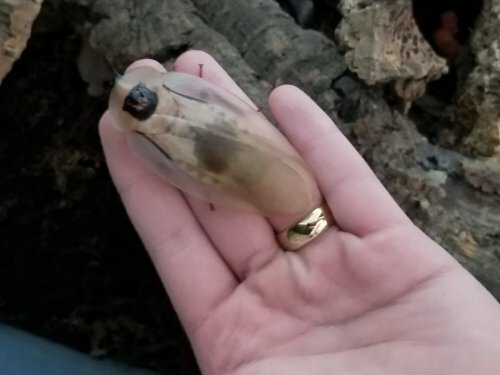 •Blaberus giganteus(giant cave roach)-these take a LONG time to reach maturity, but are very active and will make great large feeders in the future for the parson's. Picture doesn't do justice for how big these guys are. 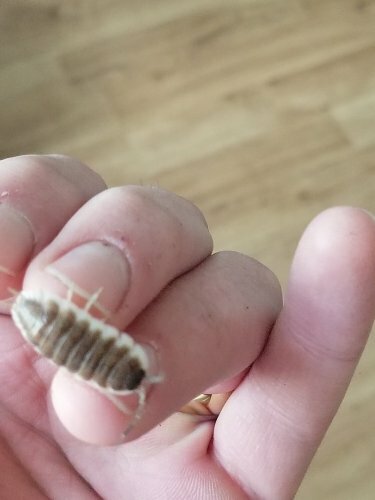 •Porcellio 'sevilla'(type of spanish isopod)-have been a little difficult to get going with some die off. They keep growing though and are already huge. About a little more than an inch so far. Have had them for almost a year now. I used to be lol, even the roach I was a little iffy about touching. If it decided to bite, I'm sure it wouldn't be fun. Never been bit by a roach though. 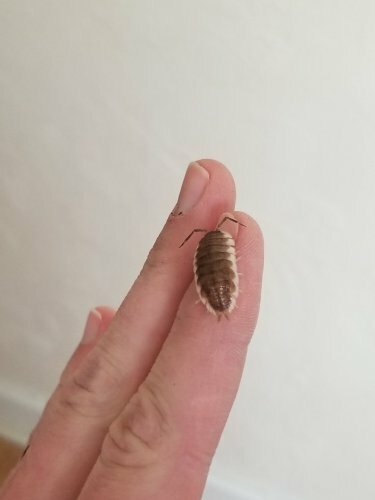 I've also got a healthy eebyjeeby about the bugs in general...but wow. That stick bug is beautiful! Ok that roach is what my nightmares are made of!!!! The stickbug brings back childhood memories though. I love it! What has been seen cannot be unseen! The stickbugs are awesome. So huge and colorful, takes about 2 years to establish a colony from just nymphs at this rate, but will be worth it. They'll make great feeders down the road and I enjoy them just as 'pets'. Feeding them is going to be a PITA though. Incoming angry wife at me having garbage bags full of oak/raspberry/rose branches in the freezer every winter. Well they have been nice to me so far and have not tried to latch on to my finger. When I was younger I was quite the tom boy. I lived in Alabama and would climb trees to get to the "sack caterpillars". Not sure what they were but I thought they were fantastic at 8 years old lol. I loved bugs and everything creepy crawly as a kid. I'd find snakes and pick them up, only to end up bleeding lol. I'd even pick up spiders and centipedes. Was fearless...Steve irwin was my role model lol. now I got soft! Yeah my mom was constantly yelling at me for the things I caught. I was a lightening bug freak. I would go out every night and capture a bunch. Put them in a mason jar with tiny holes in the lid. Fall asleep to their light show in my room. Then the next morning I would free them and repeat the whole thing that night lol. When we moved to AZ there were horned toads everywhere. I was absolutely in love with them. I made her get me a refrigerator box that I put in the back yard. I filled it with dirt, plants and sticks. I would catch them... feed them bugs I found and then release them after a week then hunt for new ones. I watched way too much Steve Irwin as a kid as well. Sounds a lot like me! Never got to catch horned toads though lol, sounds pretty cool. I once caught a bat out of midair with a butterfly net at like 6 years old haha. I'm eager to try some leaf insects and indian sticks from FullThrottleFeeders.com but the food is holding me up. Nothing has fully bloomed yet. How much do you go through in a week for your guys? I have blackberry bushes but I'm not sure they're thick enough for me to cut off a branch every week. Mine really like oak and raspberry which grow all over the place here. They ate a lot more as they were growing, slowed down now. These guys also like a good misting twice a day. Trying to think, with only 5 of them(can't imagine what hundreds will be like...) they ate through about a 2-3ft branch with leaves probably once every 2 weeks or so. That might be way off, in the summer I'd just throw a ton in their and it'd hold them over for a while. I also decided to go bioactive with them instead of cleaning out paper towels, leaves, and poop constantly while trying to separate tiny eggs. I'm just going to let them all hatch in the enclosure and see how it plays out. Oh they were amazing. I brought home a bat as well when I was about 9.... Went on an adventure in these like 9-15 foot trenches where they would build nest into the sides in the deep holes. Anyways I found one laying there slightly moving... freaked out took it home in my bare hands to my mom wanting to help it. She of course freaked since they can carry all sorts of things. It was dead by the time I got it home. She told me I was never to bring another bat home LOL. 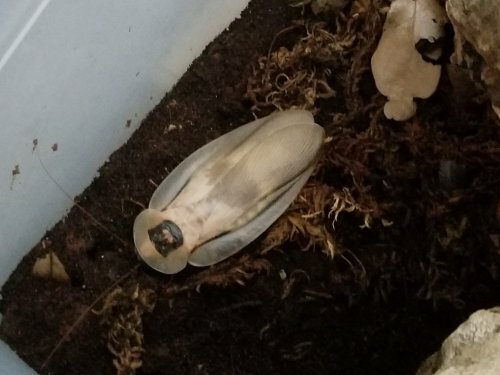 Oh, I love the cave roach. I used to breed those too, they're awesome! I might have to get some again. You have snails too right? Would you mind taking a picture of your snails/setup? I'm hoping to get some going.